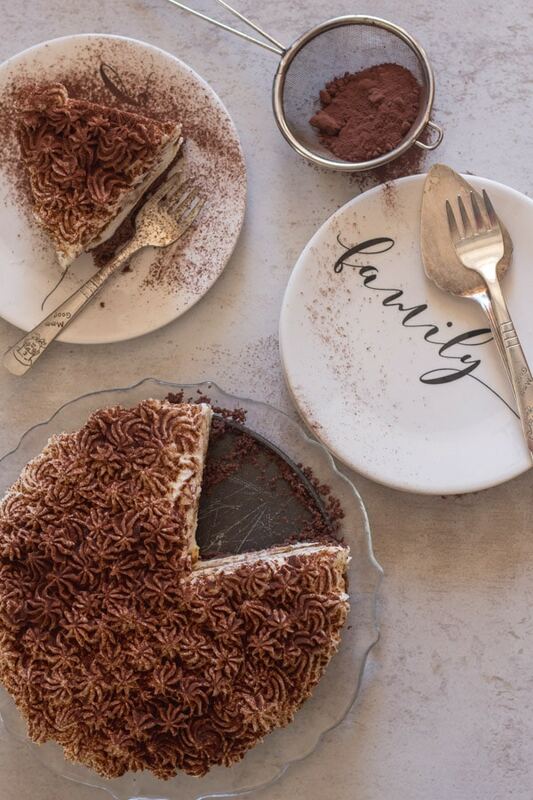 A creamy no bake Tiramisu Cheesecake, Classic Tiramisu meets cheesecake, works perfectly and tastes even better! The perfect dessert idea. No Bake Cheesecake is one of the easiest and delicious desserts to make, from this No Bake Berry Cheesecake, to Cheesecake Tarts and I can’t forget my daughter’s favourite, Skor No Bake Cheesecake with a Caramel Drizzle. In our house there are two favourite desserts. 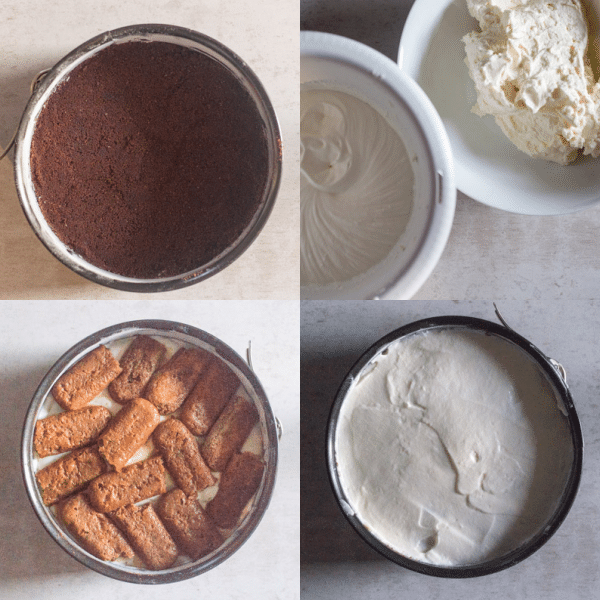 Cheesecake and Tiramisu. So combining them together was the perfect solution. I Actually made this as our Christmas dessert, because to tell the truth I made it last minute. My daughter came in the kitchen on Christmas Eve asking what are you making for Dessert? Oops and here it is! 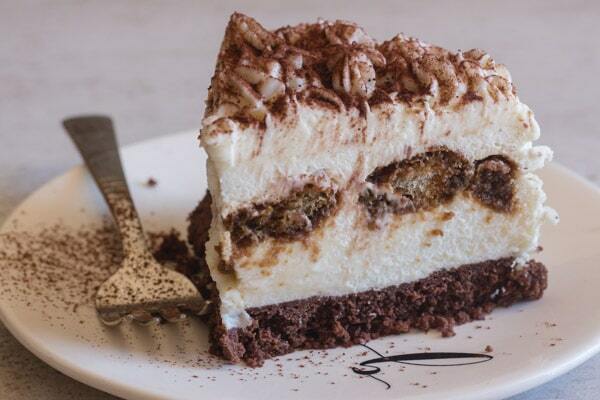 Tiramisu Cheesecake. Making the best No Bake Cheesecake is easy. 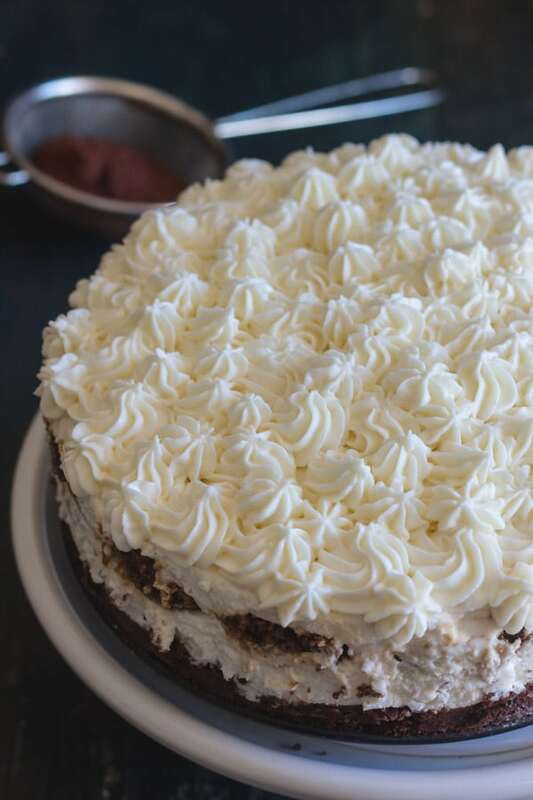 Just make sure your cream cheese and mascarpone are at room temperature, so that they whip up perfectly light and fluffy! Your whipping or whole cream should be cold straight from the fridge. It’s up to you if you want to use leaf or powdered gelatine, four gelatine leaves are equal to 3 teaspoons of powdered gelatine (8 grams). Leaf gelatine if very popular and used by most people here in Italy, although I have used powdered also and I actually use it in this Cheesecake Recipe. They say leaf gelatine gives you a smoother and clearer texture. To dissolve gelatine powder, in a small pot add a small amount of the liquid that you are using in the recipe, usually about 1/4 cup is all you need. Sprinkle the powder on top, mix together with a fork or small whisk, then let it sit for about 5 minutes. Heat the mixture just to dissolve the gelatine (never let it come to a boil). Add a little of the whipped ingredients to the gelatine mixture to cool it down before adding to your filling. To dissolve the leaf gelatine, just soften the leaves in cold water for about 5-10 minutes, then squeeze the excess water. Add the leaves to the liquid you want to set. If your liquid is cold, stir it gently in a saucepan over very low heat until the gelatine dissolves, of course never let the liquid boil. No Bake Cheesecakes are perfect anytime, not only during the summertime when you have no desire to turn on the oven. 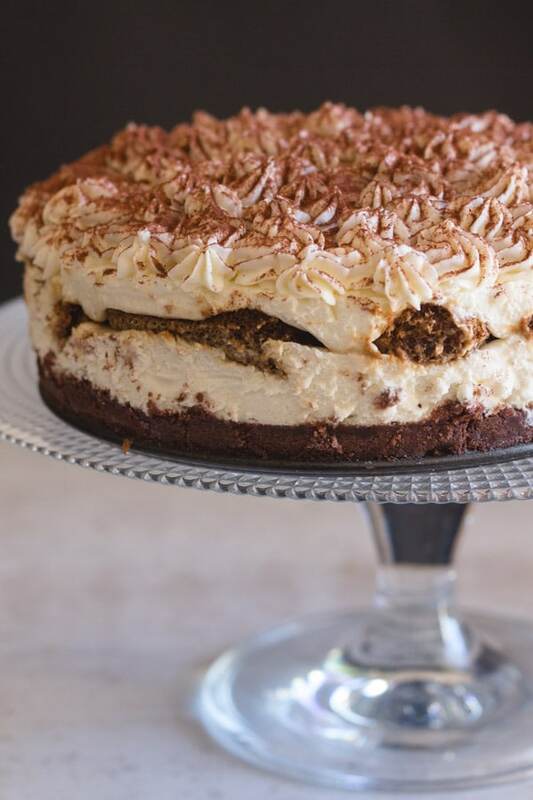 I make my Tiramisu Cheesecake with strong espresso coffee, but regular or even decaffeinated coffee will work too. 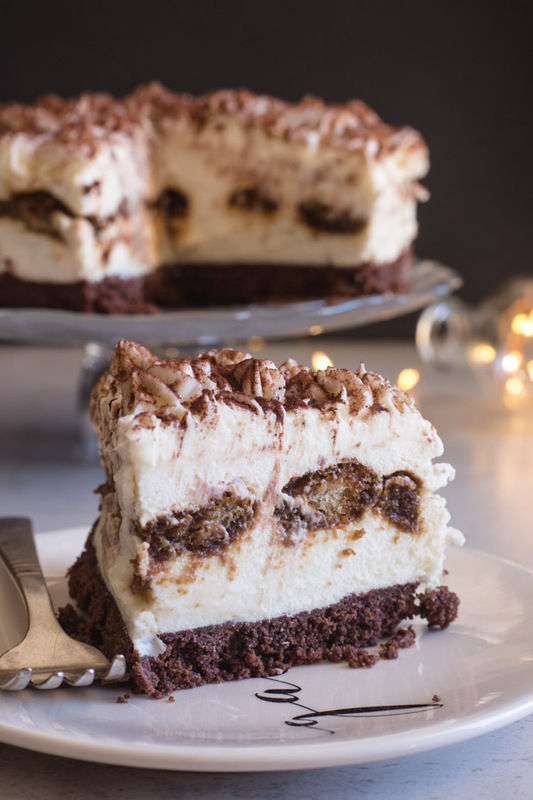 So whenever you are craving a slice of Tiramisu or Cheesecake why not combine them and make a No Bake Tiramisu Cheesecake? Enjoy! Mix together the cookie crumbs and melted butter and press down in a lightly buttered 7.5 - 8 inch (19 -20 cm) springform pan, place in the refrigerator for 20 minutes. Meanwhile in a large bowl beat together the cream cheese and mascarpone until light and fluffy, add the sugar and vanilla beat to combine. Beat the cold whipping / whole cream until soft peaks appear, then add the cream cheese mixture and beat just until combined. In a small pot mix the gelatine and 1/4 cup (55 grams) of whipping cream, let sit for 5 minutes. Then heat and stir just until the gelatine dissolves, do not boil. Add a tablespoon of the tiramisu filling and stir to combine. Then add to the bowl of tiramisu filling, beat just to combine. 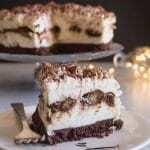 Remove the base from the fridge, spread 1/3 of the tiramisu filling over the crumbs and top with the lady fingers soaked in coffee*, top with another third of the filling, make a decorative topping on top with the remaining filling. Refrigerate for 12 hours or over night, sprinkle with unsweetened cocoa before serving**. Enjoy! *place the coffee in a plate and roll the lady fingers in the coffee (turning once on each side, break the cookies to fit. **Run a knife around the edge of the pan before removing.